First we talk on the phone about what you would like help with – prior to booking your actual hypnosis session(s). You arrive at my office (specify San Rafael or South Bay area near Cupertino, CA) and have a seat in my comfortable office. We do some brief, essential paperwork and discuss what hypnosis is/and is not. Then, I get to learn from you more about the issue you’ve identified. After exploring it and how you prefer to feel/think instead (as this is all client-centered…about what YOU want), I begin the process of hypnotherapy with you after you make yourself as comfortable as you’d like to be (most lay down on the couch or hypnotherapy reclining chair, while a few prefer to sit upright and relax). All the while, I am seated across from you in my chair (during both the talking and hypnotherapy). I’m trained to use my voice to help you to enter the pleasant state of hypnosis. You will reach the level of hypnosis that you feel comfortable with in each session (and often, clients go much deeper in the second to fourth sessions, after kind of “checking out” what hypnosis is like in the first session). The actual hypnosis/hypnotherapy includes giving you purposeful suggestions to help you accomplish what you want to do, and your powerful subconscious mind takes in the suggestions that will be useful to you. When the session is coming to a close, I prompt your subconscious to accept those suggestions that will be useful to you, and use them for your best interest, and let go of those not useful to you. Finally, I bring you gently out of hypnosis, and we may discuss what you experienced for a few minutes (2-5 or so) if time permits. Afterward, you may feel rested and relaxed, as if you’ve had a much needed nap. Some say during the start of the following session that they slept better the night after the last session than they have in some time. Initially, we talk (on the phone) about what you want to make progress upon – before scheduling your actual hypnosis session(s). Then, I prepare a session specifically for you and what you want to address. At the scheduled time, I call you and we discuss more thoroughly what you want to make progress upon (which helps create some of the customized wording used in your hypnotherapy session). Then, I begin the hypnosis session. It is ideal for you to wear a head set for phone sessions (or have the audio of my voice coming through your computer on Skype) so you can fully relax (without having to hold a phone). 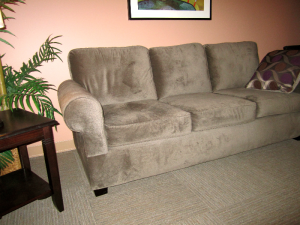 Before and during the hypnotherapy, you can make yourself comfortable (laying back on a sofa, chair or bed…or seated if you prefer). While you can help yourself relax by being covered with a blanket or throw, as the Hypnotherapist I need to see your breathing if we are using Skype, so it’s best to have your head and upper torso showing in the view I have of you. It’s helpful for me to see your breathing and any facial expressions or movement you may have during the Hypnotherapy. Why have a phone or Skype session instead of an in-person session? 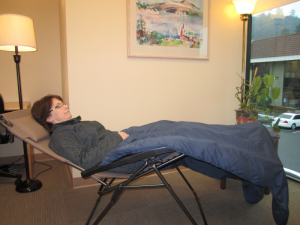 Some people feel more comfortable relaxing in their own living place to experience hypnosis. Others simply just live to far away from my offices, yet want to work with me. And always remember, whether the session takes place in-person or on the phone (or Skype), you can benefit from working with your subconscious. In either location, hypnosis is not a loss of awareness…so you will take in what is being said whether you are in the room with me, or simply hearing my voice. Both in-person and phone/Skype sessions are completely customized to each client and what they want to address. * While Hypnosis/Hypnotherapy sessions may be done by phone or via Skype on a computer, Past-life Regression sessions must be done in-person in my office.